Everybody knows that plastics are bad, but have you ever stopped to wonder just how bad? I've decided to tackle a subject which is viewed as controversial by many but something that has been on my mind for the last couple of years since I read a phenomenal book by Deborah Cadbury. 'Feminization of Nature' is just as ground-breaking as Carson's 'Silent Spring' and I do hope that I am forgiven the use of the title for this post. In the book Cadbury talks about how pollution from plastic manufacture, use and degradation releases a class of chemicals called phthalates which mimic the female hormone, oestrogen. They are added during the manufacturing process to increase their flexibility, transparency, durability and longevity. This chemical accumulates by biomagnification through the food-chain. This means that the top predators have the highest concentration of the chemical. 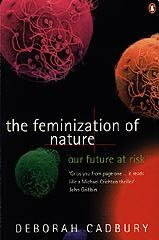 The book was published in 1997 and it examines evidence and reads like a scientific detective story that uncovers adverse changes to human and animal reproduction. It starts off by stating a Danish study that reports a 50% drop in sperm count in fifty years, confirmed by similar studies in Edinburgh and Paris. It also questions the startling increase in hormonal cancers like testicular, prostrate, ovarian and breast cancers. Not only are these chemicals affecting human reproduction but there are many species that are showing signs of 'feminization' that shows increase in hermaphroditism, reduction in sperm count and quality, production of eggs by males etc. All of these changes have been linked to these man-made chemicals that act as 'weak oestrogens'. Since hormones are the most potent chemical messengers in the body that act directly on the genes, they are crucially important for proper reproductive functions. What is truly frightening is that we are all eating, drinking and breathing in these chemicals and they affect babies even before they are born. They are literally changing the way we reproduce. Recently BBC news ran a small article on the subject with the latest research findings by a team from the University of Rochester - phthalates have been termed 'gender benders' and they are found in literally any form of plastic. This new research shows that it affects the way that boys' brains function and shows that male foetuses exposed to high levels of these chemicals prefer to engage in more feminine play habits. The EU and California State have even banned toys containing phthalates for a few years now, but this does not stop it from showing up in milk bottles which are used to feed babies. Various forms of phthalates are used in every form of packaging (and non-packaging) you can think of including PVC flooring, shower curtains, paints, printing ink etc etc. So what can we do? It boils down to a lot of things that I have been writing about so far: reduce the use of chemicals in every avenue of life. Reduce use of plastic, rethink your makeup, your clothes, your toiletries. Bring your own bag. Be kind to the Earth because what you throw out comes back to you somehow or the other.